The old engineers joke that “speed doesn’t kill, rapid deceleration does” applies to all vehicles capable of attaining dangerous velocities. Since we have been concentrating on improving project STi’s acceleration and handling, we have definitely achieved the ability to reach deadly velocity on the track. 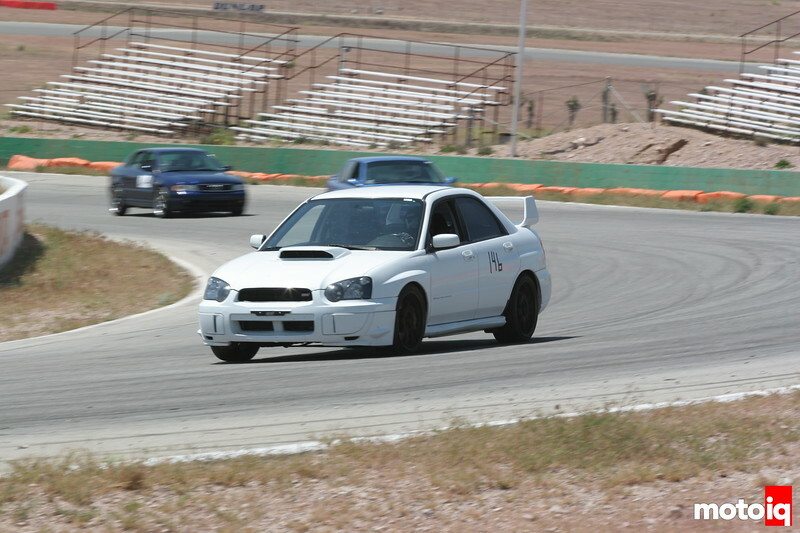 In our first foray onto the grounds of Willow Springs raceway we noted that perhaps we were starting to drive beyond the capabilities of the stock brakes due to the higher speeds that we were able to attain on the straights. 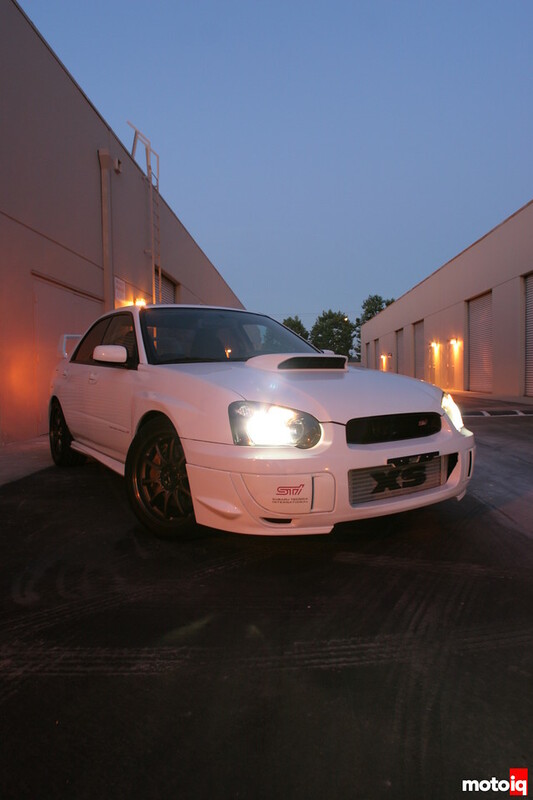 To read the rest about Project Subaru WRX STI click here! Since our STI gets driven on the track, we had to do some brake upgrading. The STi is blessed with excellent, large, competition worthy Brembo brakes from the factory. However these Brembos are somewhat hamstrung by the requirements that the STi be a civilized street car. 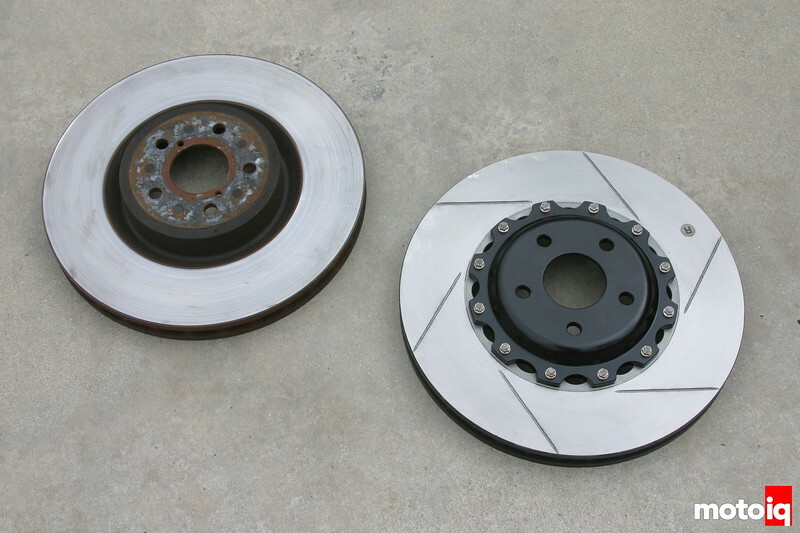 Street drivers usually don’t tolerate any sorts of squeaks and squeals that high performance brake pads are prone to. Thus the brake pads that the car is equipped with from the factory are compromised to be less than optimal in hot braking performance with quietness and effectiveness when cold. Usually a brake pad works the best within a given temperature range. A pad that works best when hot, often works poorly when cold and vice versa and Subaru compromised in the conservative cold direction. When comparing the stock rotor to the DBA rotor, the weight saving alloy hat and slotting are easily noticeable. When driven on the track the stock brakes were not horrible as stock brakes often fade away to nothing when pushed hard. We did notice that the brakes did fade, losing about 25% of their effectiveness then stabilizing for the duration of the track session. Although this was not horrible for OEM brakes, it was not exactly confidence inspiring either. Although we could have simply installed a super duper mega huge brake kit, we decided that we did not really want this approach for several reasons. When viewed from the edge, the thermo paint for temperature indication in use and the more open vaning of the DBA rotor becomes apparent. The first reason is that the 2004 STi is prone to suffer what is called brake caliper piston knockback. The 2004 tends to wear its wheel bearings. This causes the wheel and brake rotor to wobble around when subjected to cornering load. This wobble knocks the brake caliper pistons back into the caliper. When the brakes are reapplied, the brake pedal height is now lower than usual because the pistons have been knocked back into the caliper and must be pushed back out to contact the rotor. In extreme cases the pedal may drop to the floor and must be pumped to regain braking power. Subaru recognized this problem and the 2005 and later models have bigger hubs and wheel bearings to eliminate the issue. Ask Sarah: I Need More Track Time From My Water Injection System!